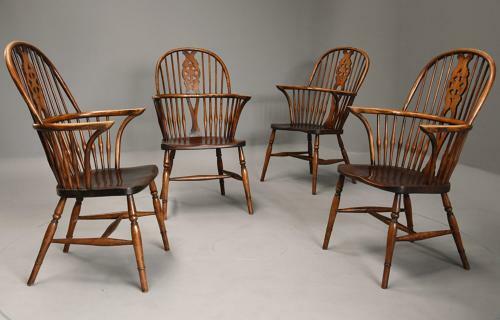 These chairs consist of a hoop back leading down to a central pierced splat with wheel design with four turned spindles to either side. This leads down to the arms and the shaped elm seats supported by four turned legs joined with an H stretcher. Please note: will consider splitting into 2 pairs, please contact me to discuss.